Unless things have become really bad between the two. KUALA LUMPUR -- Tan Sri Muhyiddin Yassin today said that it is appropriate for the Sedition Act 1948 to be maintained with several improvements made because it serves to preserve unity and national harmony, and not aimed at protecting the interests of the Malays alone. The Deputy Prime Minister said it was apt for the government to take stern action to curb some quarters from making statements which touched on racial and religious sensitivities that could spark tension because prevention was better than cure. Hence, he expressed the need for several provisions to be inserted in the law to prohibit anyone from questioning the provisions in the constitution that safeguarded Islam as the religion of the federation. "This act is also needed to prevent anyone from questioning the rights of believers of other religious faiths to practice their religion. "Likewise, with the position of the Malay reserve land and the Royal Malay Regiment which are part of the decisions by the Malay rulers that have to be protected from any acts of sedition," he said. Muhyiddin, who is also Umno deputy president, said this in his speech at the simultaneous opening of the Wanita, Youth and Puteri Umno assemblies in conjunction with the 2014 Umno general assembly at the Putra World Trade Centre here. He also reminded party delegates to be firm in opposing extremism and militancy which were rapidly influencing young people who wanted a short-cut to heaven. "We will not compromise with those who attempt to twist the meaning of 'wasatiyyah' (moderation) which is synonymous with the Islamic principles of moderation by bringing deviationist ideologies, like liberalism and secularism," he added. Muhyiddin said Umno could not remain at its old notch by making police reports or putting up banners in tackling pressures against Islam, but with knowledge. "We have to have more discussions, publications and discourse on freedom and human rights according to the Islamic perspective and how Islam deals with secularism. "We have to address secularism in religion by being steadfast in faith and sharpness of the mind, and not shrouded by blind emotions," he said, adding that Islamic institutions and law enforcement should be emphasised through cooperation with Islamic non-governmental organisations. This, he said, was because Muslims were now in the post-modern world that regarded religion as an obstacle to human freedom. Yes Bro , i can surely sleep well tonight. I'm very encouraged by the part .." We will not compromised with those who attempt to twist the meaning of wasatiyah ........ by bringing in deviationist ideologies like liberialism and secularism ." This is a very clear and hard message that hopefully will knock the sense out on ' bintang 'WCW and that Temerloh reject Pudin . Muhyiddin is going to take the biggest risk of his life. He's going to go for the president in the next party election. It is now or never. He's kinda tired of playing safe all the time. After all he's 67. He has gone this far and he now willing to risk it all. Not trying to give it a shot is a missed opportunity of a life time. This is going to be the biggest gamble of his life. 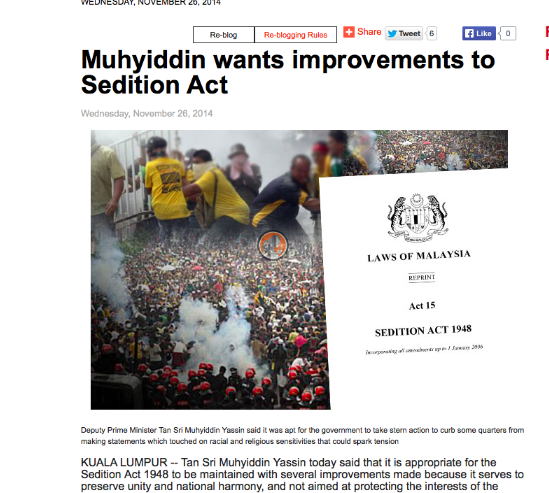 I am not suggesting the sedation act should have been abolished and that Najib should not have promised that he will. This only shows what Najib is when it comes to keeping his promises, this is like the promise he made before the election that he will build one million affordable houses if he was retained in Putrajaya. He is retained in Putrajaya, even though with as minority, nevertheless still as the tenants of Putrajaya. And did he build those one million affordable houses as promised ? Far from it he has not only failed to build or has planned to build a single one as promised. This is a typical kind of his broken promises, therefore don't be surprised of him breaking his many other promises. Is this the kind of leader we want as PM ? Or as usual he will break any promises as long as he can stay as PM of Malaysia including having the allegations of the ex-Sarawak's chief been investigated meticulously . Because this is the man who has been keeping and all the Umno dorky and schmucks in Putrajaya. What else he wouldn't do to remain in Putrajaya ?